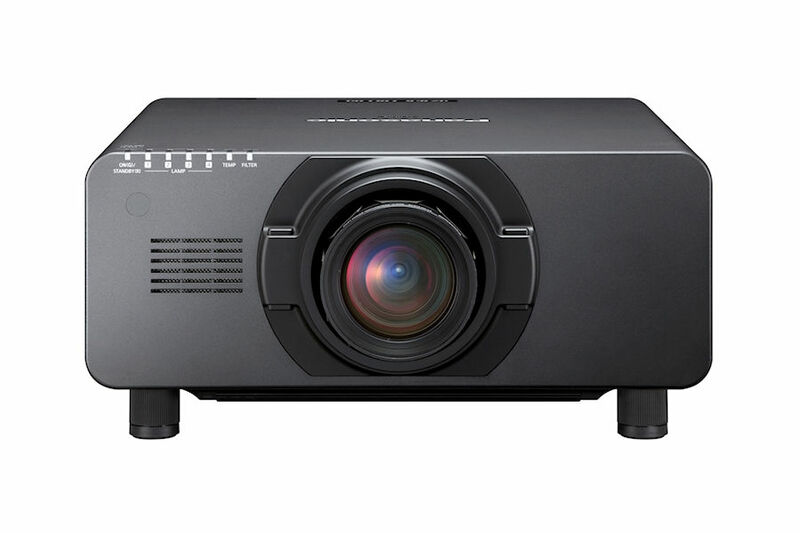 In addition to the high brightness and compact size, the PT-DZ21K2 with WUXGA (1,920 x 1,200) resolution and 20,000 lumens of brightness boasts long lamp replacement cycles of up to 3,000 hours, 3D compatibility and installation flexibility, making this projector ideal for large-venue applications such as auditoriums, museums and rental and staging that require both maximum brightness and easy handling. The Lens Memory adjusts the image size and location in up to three different projection positions and the combination of four new 465W UHM lamps and the Dynamic Iris allow the PTDZ21K2 to deliver a 10,000:1 contrast ratio to ensure super high brightness and best possible picture quality. The PT-DZ21K2 is also 3D ready and for medical school and hospital applications, the projector is equipped with the DICOM Simulation Mode*, enabling end-users to view X-ray images. The PTDZ21k2 helps realize unique and captivating video performance with numerous built-in features. The Lens Memory adjusts the image size and location in up to three different projection positions. Users can program the mechanical shutter to fade the image in and out during show transitions, and it also has built in Edge Blending, as well as Multi-Unit Brightness Control for projection onto wide screens and surfaces to create an immersive experience. Furthermore, the PTDZ21K2 can project onto various curved-screens with the Geometric Adjustment feature, which can be enhanced with the optional upgrade kit, ET-UK20, to support even more diverse curvatures and shapes with bitmap masking. 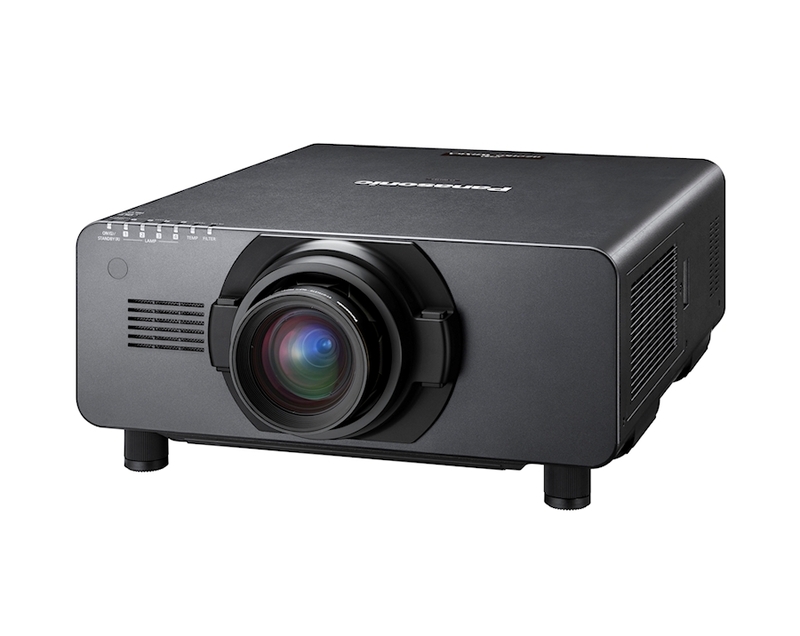 This DLP projector has been designed with an extremely small footprint due to a highly efficient optical design as well as an improved liquid cooling system that makes it possible to keep the noise level to a minimum during operation. Due to its compact size, the PT DZ21K2 total cost of ownership is further enhanced by saving warehouse space and minimizing the cost of shipping from one location to another. The PT-dz21k2 is built to maximize savings with a maintenance-free Eco Filter with a lifespan of up to 12,000 hours, and low-power consumption of 2,300W. Basic installation flexibility is provided by a comprehensive optional lens selection that supports a wide range of throw distances. 360-degree installation capability enables projection onto floors and ceilings. 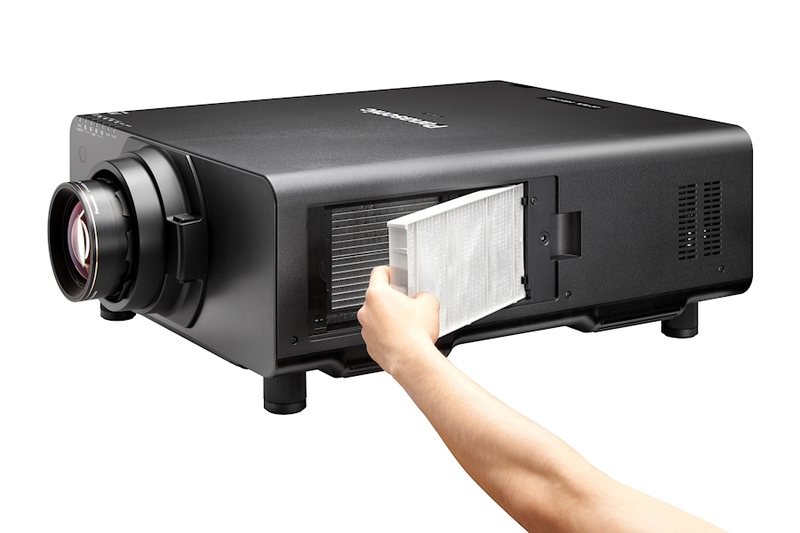 The projector also boasts high durability with an operating temperature between 32°~113° Fahrenheit. 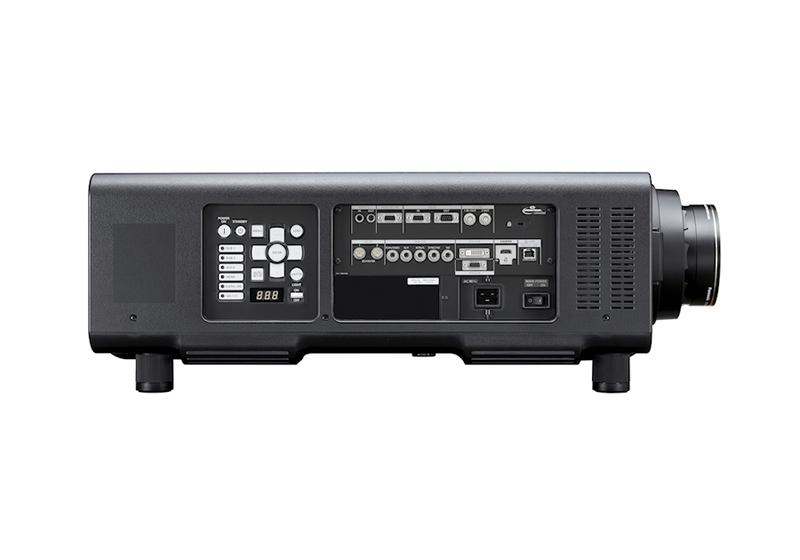 Flexibility and reliability are further enhanced by the projectors’ capability to handle more than 100 input signals. Several available input terminals include SDIx2, HDMI, DVI-D, LAN (RJ45) and 3D timing signal IN/OUT. 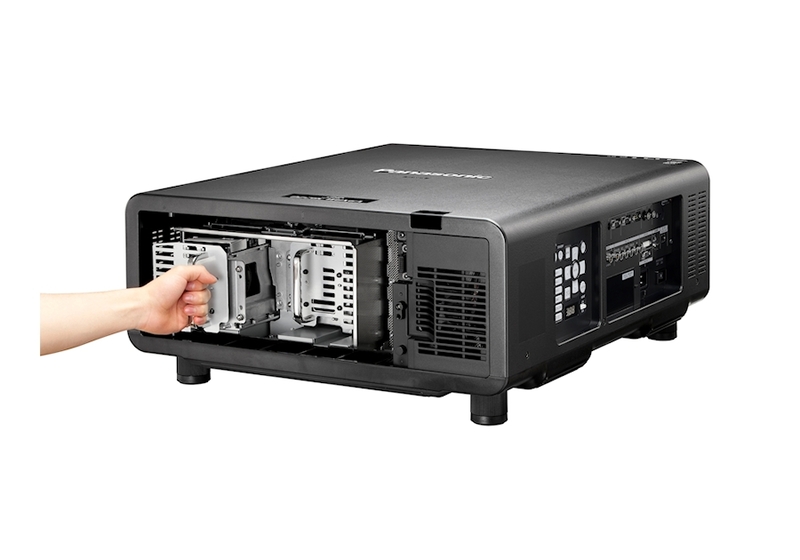 The quad-lamp system allows the projector to keep working even if a lamp should fail. Lamp Relay Mode alternates lamp operation to enable efficient and reliable 24/7 projection. Quad, Triple, Dual, and Single Lamp modes can also be used. Panasonic’s Dynamic Iris uses a scene-linking aperture mechanism to achieve a remarkable 10,000:1* contrast without sacrificing brightness. This helps the PT-DZ21k2 to reproduce deeper, richer blacks, and provides images with more textured and realistic details. DIGITAL LINK supports transmission of uncompressed HD digital video, audio*, and control commands through a single cable (CAT 5e or higher STP cable) for distances of up to 150 m (492 ft)**. Add an optional ET-YFB200G DIGITAL LINK Switcher or ET-YFB100G Digital Interface Box to further simplify installation complexity in large venues while reducing cost and improving reliability at the same time. 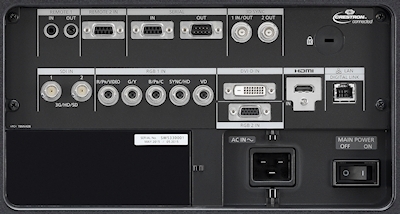 The ET-YFB200G DIGITAL LINK Switcher unit incorporates two DIGITAL LINK terminals. Video, audio*, and control signals can be output to two display devices individually or simultaneously. Sources can be easily switched using the projector remote controller or via PC and tablet, and multiple Switchers can be daisy-chained to integrate additional display devices. Panasonic developed DIGITAL LINK by adding original features to the HDBaseT™ communication standard formulated by HDBaseT Alliance. DIGITAL LINK works seamlessly with other brands’ peripheral devices supporting HDBaseT™ protocol, allowing you to easily add Panasonic projectors to existing AV infrastructure. This function adjusts the image for projection onto spherical, cylindrical, and other specially shaped screens. Adjustments can be easily made using only the remote control, with no external equipment needed. 4-Corner Adjustment and Keep Aspect Off functions also simplify fine adjustment. 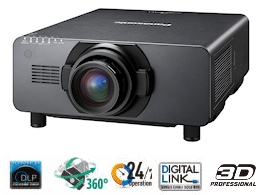 In addition, end-users can remotely monitor and operate the PTDZ21ku by using Panasonic’s own Multi Projector Monitoring and Control Software and the web browser feature enables users to view and send email alerts from the projector. Panasonic’s unique quad-lamp system, with its new high-power lamps, has helped to make the body extremely compact while providing an astounding 20,000 lm of brightness. Compact size, light weight and low operating noise let the PT-DZ21K2 suit more applications. Active 3D projection capability (PT-DZ21K). Up to 3,000-hour lamp replacement cycle. The four-lamp system allows the projector to keep working even if a lamp should fail. The Lamp Relay mode also operates the lamps alternately to enable 24/7 projection. Four, three, two and one lamp modes can be used. Environment-friendly, low power consumption of approx. 2,500 W.
Newly developed optical engine and liquid cooling system minimize the hassle of maintenance. Liquid cooling system allows use in ambient temperatures from 0 °C to 45 °C (from 32 °F to 113 °F)*4 with a compact body and quiet operation. A dust-resistant cabinet and new, reusable “Eco Filter” that needs no replacement for 12,000 hours*5 protect optical components from dust. Optional Smoke Cut Filter ET-SFD510 available. A lens-centered design, a wide range of optional lenses, powered H/V-lens shift, and flexible vertical 360-degree installation. Lens lock function to secure the lens installation condition. Mechanical lens shutter with fade in/out effect. Optional “Geometry Manager Pro” available for more flexible geometric adjustment and masking function. Abundant terminals, including two SDI (3G SDI and HD SDI), DVI-D, HDMI and 3D timing signal in/out. Multi Projector Monitoring & Control Software optionally available. 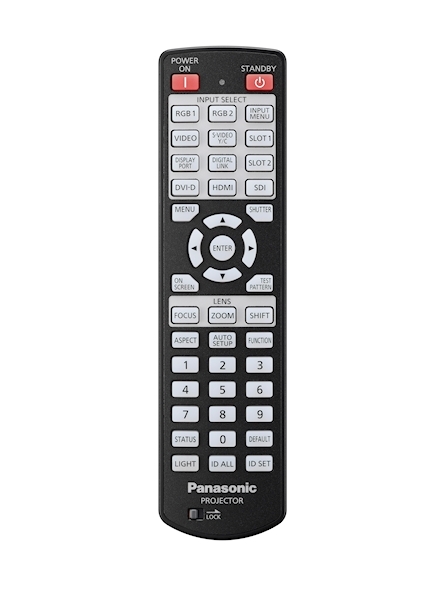 Carefully manufactured at the Panasonic factory in Japan, under strict quality control. Lamps can blow, if you need your projector working and can't afford down time, you may need to keep a spare lamp. 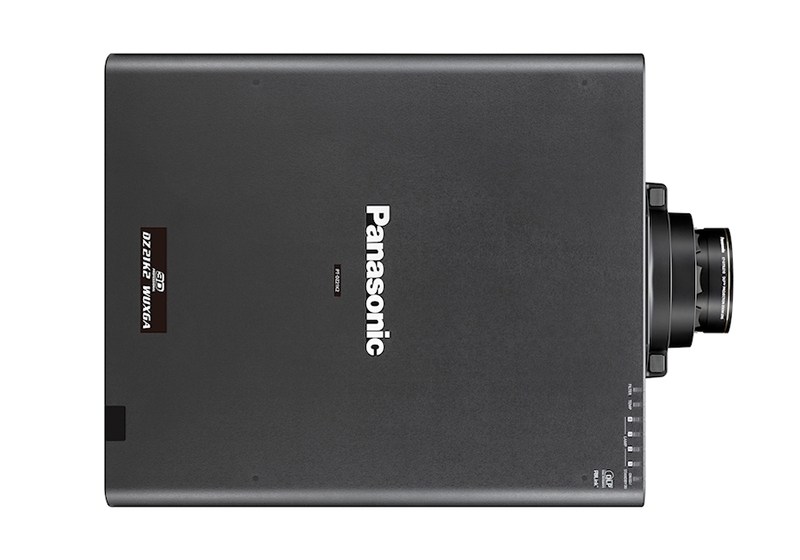 The replacement projector lamp for the Panasonic PT-DZ21k2 is the ET-LAD510.